Underwater dock lighting creates a beautiful shimmering lighting display right in your own backyard. But that’s only the beginning. When designed & set up properly, underwater dock lighting attracts all types & sizes of amazing marine life. Image your dock as a nighttime live aquatic entertainment zone that is fun & even educational for your whole family. And if you’re a fisherman get your gear ready because your lights are sure to attract snook and other predator fish. 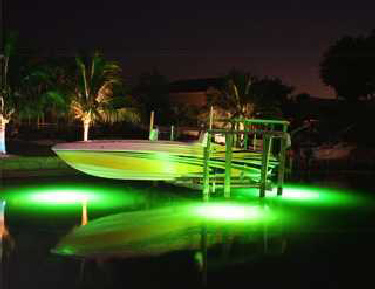 Our underwater dock lights are equipped with everything you need to light up your waterway and attract fish in any body of water. We only install top quality, UL Approved, environmentally friendly components providing years of trouble-free enjoyment. The Brightest HID & LED Lights! Real Self Cleaning Dock Lights! 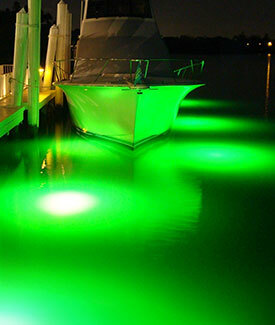 At Coastal Outdoor Lighting we are avid boaters & fisherman that understand the South Florida waters. Our team of fully trained and certified technicians have been installing and repairing outdoor lighting systems in SWFL since 2001. Sit back, relax, and enjoy as these amazing lights beautifully illuminate your waterway and attract amazing marine life. For the very best in underwater dock lights and a “Free” Onsite Consultation complete our online request form or for the fastest response call us today at (239) 491-6759.